This majestic nativity representation from Singapore was made by a Buddhist family. The medium used is paste from the bark of the Cinnamon tree, called pate d'encens. The tiny but bustling island state of Singapore, formerly a part of Malaysia, is situated at the crossroad of many cultures. This nativity set reflects the influence of East and West. The baroque style of posture and vestments suggest a Latin origin, possibly Portugal or Spain. The facial expressions convey some of the mysterious gravity of Asian religious traditions. Made of pate d'encens, the figures are light and fragile. Their brittle existence is in stark contrast with their imposing stance and proud bearing. Gathered at the manger, the kings are but fragile majesties. 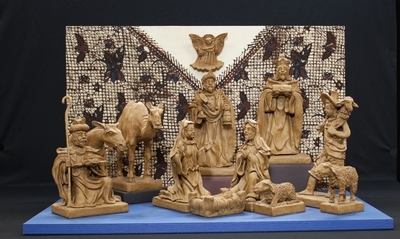 Figures depicting the nativity of Jesus, created by the Tay Family in Singapore in 2003 from pate d'encens, a paste made from the bark of cinnamon trees. Exhibition label originally written by Fr. Johann G. Roten, S.M. for exhibit entitled "At The Manger" and held at Roesch Library, University of Dayton.